Add appeal and value to your property with new garage doors from Active Garage Doors. As a premier garage door company in Bartlett, IL, we install custom doors and provide a high level of services that can't be beat. Most importantly, we value our customers and actively strive for your complete satisfaction. Does your garage door need a makeover? If it is rusty, falling apart, or simply outdated, turn to our team for comprehensive garage door services. In addition to providing repair services, we also specialize in residential and commercial garage door installation. Customers throughout the area have come to trust us as their garage door contractor. Why? We maintain a reputation for being honest, courteous, and accommodating. We refuse to discredit our good name for the sake of making a dishonest dollar. Contact us, and we'll show you a portfolio of our finished projects and answer any question you may have about our products and services. Is your garage door damaged or stuck? This is particularly a problem if you cannot close it. A jammed door directly affects the security of your home. As a full-service garage door company, we are proud to provide 24-hour and same-day emergency services. Simply contact us, and we'll correct the problem at any hour of the day or night. Don't open your home to burglars. Instead, let our repair technicians provide immediate garage door services. Since we are continually striving to improve our level of customer service, we do our very to make our services affordable for you. 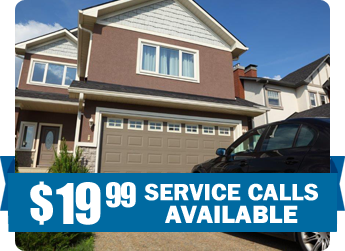 Currently, we are offering an excellent special: $19.99 service call. Contact us for a quote if you need garage door repair or installation. We'll also provide a free estimate if you are considering a new door. Contact us if you'd like a new garage door for your home or business. We proudly serve customers in Addison, Glen Ellyn, Wheaton, Elmhurst, Bloomingdale, Carol Stream, Bartlett, Roselle, Schaumburg, and Elk Grove Village, Illinois. Addison, Glen Ellyn, Wheaton, Elmhurst, Bloomingdale, Carol Stream, Bartlett, Roselle, Schaumburg, and Elk Grove Village, Illinois as well as the surrounding areas.